Founded in the lead-up to 2010 World Cup South Africa, United Against Malaria (UAM) is an alliance of football (soccer) teams and heroes, celebrities, health and advocacy organizations, governments and corporations who have united together against malaria. As part of the Roll Back Malaria (RBM) Partnership, UAM is made up of over 200 partners from diverse sectors and continents that invest their experience, time, funds, skills and enthusiasm because they share a common goal. By championing African leadership across sectors and harnessing the collective capabilities of a range of corporate partners—using football, the world’s most popular sport, as the foundation—UAM aims to raise global awareness and galvanize worldwide commitment to end malaria deaths. 2. Increase the number of UAM supporters within the global RBM Partnership. Delivering grassroots messaging and advocacy through football – including public service announcements (PSAs) that feature local football stars, and football clinics for young players in rural towns across Africa. After watching or hearing a UAM PSA during the 2010 World Cup, 6.6 million Tanzanians reported taking action to ensure that their families sleep under a treated mosquito net every night. Multiple PSAs featuring the Ghana Black Stars saturated football stadiums and airwaves with malaria control messages, reaching more than 14 million viewers – or 70% of the population. Generating political will through football leadership – including partnerships of football federations and other organizations to engage heads of state in African and donor countries. UAM counts among its supporters more than 20 football federations as well as governing bodies such as Federation Internationale de Football Association (FIFA) and Confederation of African Football (CAF). Similarly, global leaders including President Jakaya Kikwete of Tanzania, United Nations Deputy Secretary-General Dr. Asha-Rose Migiro and UK Prime Minister David Cameron have each demonstrated their support and commitment to UAM. Empowering African corporate partners to commit and take action – including UAM’s Malaria Safe initiative, which provides corporations with the education and advocacy tools to protect their employees and local communities from malaria. To-date, more than 10 million employees have been reached through Malaria Safe. Expanding UAM merchandising, fundraising and marketing – including the UAM bracelet initiative started by the Relate Trust and African corporate partners; the colorful string of beads has become a symbol of winning the fight against malaria. 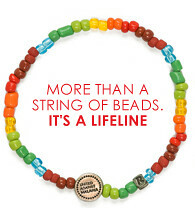 The United Against Malaria bracelet is a powerful symbol of hope for those affected by malaria, HIV/AIDS, and poverty. For every bracelet sold, at least $1 goes to the Global Fund to Fight AIDS, Tuberculosis, and Malaria, which has provided nearly 230 million insecticide-treated nets to malaria-endemic regions since 2003. Another $1 provides wages for the South African men and women who make the bracelets, an employment project of the Relate Trust. Mostly pensioners, these individuals affected by HIV/AIDS are lifting themselves out of poverty, despite local unemployment rates of more than 50%. The remaining $1 of the purchase price covers materials and marketing, greatly subsidized by UAM corporate partners. Over 500,000 bracelets have been sold to-date, raising funds for the Global Fund to Fight AIDS, Tuberculosis and Malaria, the world’s largest distributor of mosquito nets.